Yesterday saw the start of my 3rd simultaneous CoC campaign. 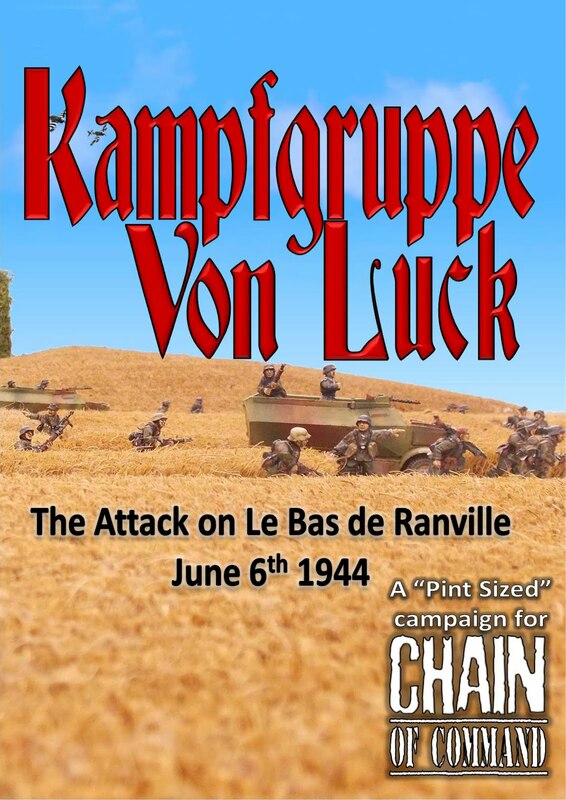 Back to Normandy and D-Day in this one, with action between British Paratroopers and the German Panzergrenadiers east of the Orne River. In our campaign we see an attempt by the Germans to counterattack and capture 2 bridges across the Orne that the Allies are holding after their initial June 6th attack. The German troops are 3 Panzergrenadier Platoons from 125 Panzer Regiment an element of 21 Panzer Division. The British have 2 platoons from 12 Para and 1 Platoon from 13 Para. 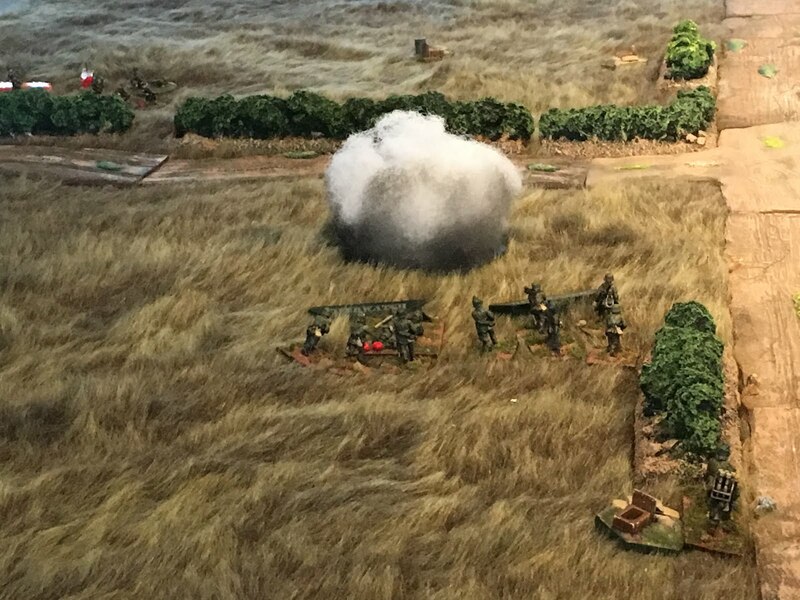 Unfortunately for the Brits, the men in 12 Para were dispersed after their intial drop so their platoon is incomplete for each of the early scenarios. Anyway on to our game. 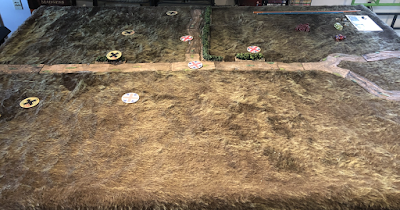 The table follows and is quite simple with very little cover and played according to scenario 1 from the main rulebook. It was a pretty quick game, Mike used the Werfer Barrage to great effect and is was 4 phases before I got on the table. By then I think Mike had 3 squads in place all on Overwatch making it very tricky to deploy. The fact that he was able to get his north-most JOP so far east also somewhat stymied me. I was able to lay some smoke down from the 2"mortar as well as throwing a smoke grenade causing him to hit on -1. It quickly became obvious that I was not going to cause too much damage and I felt lucky to get my 1st section off with 7 causualties and a dead JL after taking a pounding fro 3 squads on a double phase. 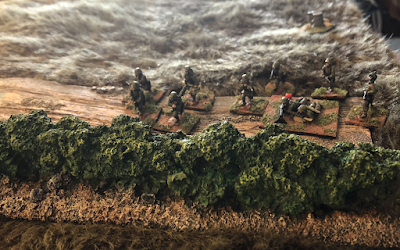 The Germans suffered a single casualty. Well knowing that the 1st scenario was going to be short, I actually had clevely set up the 2nd table so we would be already to go. 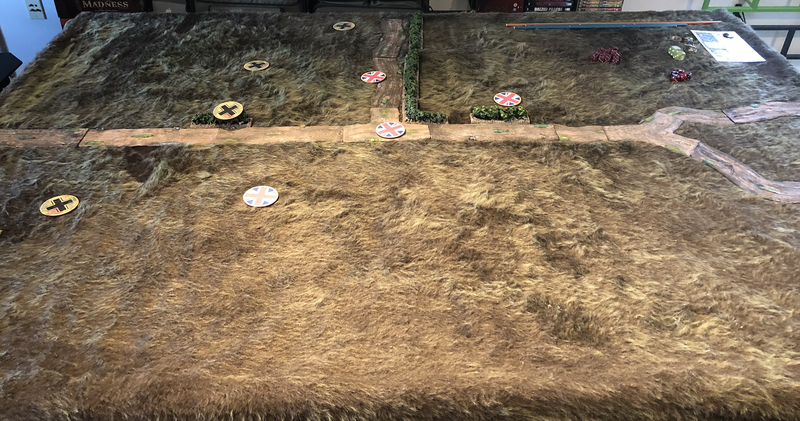 A rapid removal of the terrain mat and with a 15 minute rapid set up of table 2, it seemed we would be good. Lack of sleep (I worked until 2am that morning and was up at 6am) and rushing however is sometimes very counter-productive. 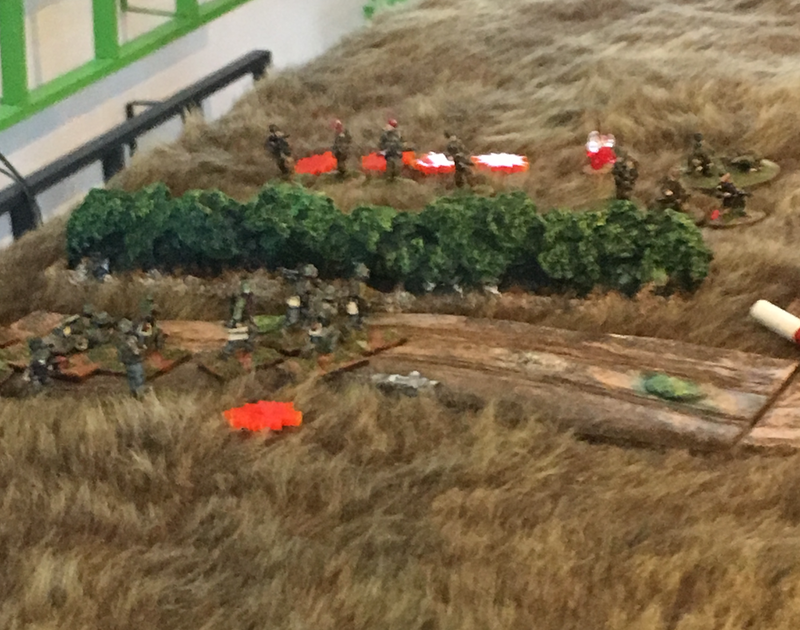 We played the whole game, I think we made a few minor mistakes in the game play and a fairly rapid withdrawal by the Brits (there is not much you can do with 19 men as I only added a 3 man Bren Team, a Sniper and the JL for section 3). 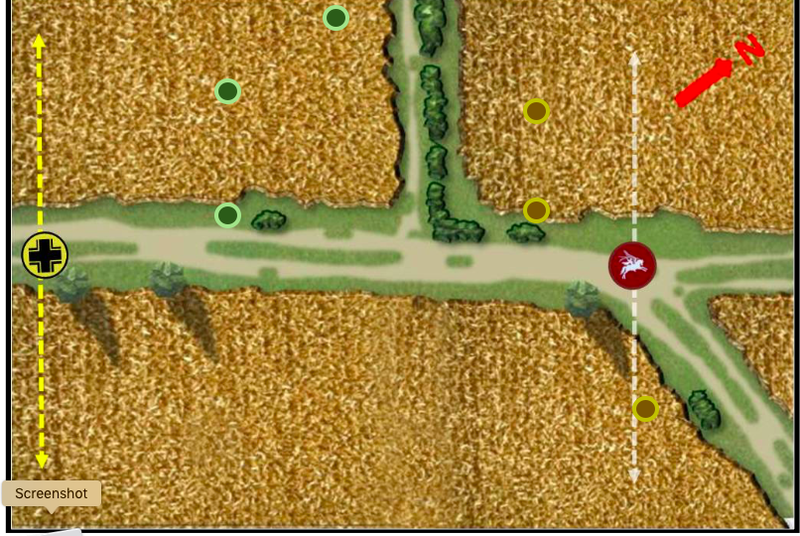 Unfortunately, I recognised after we finished up that we had played the Patrol Phase along the long axis of the table rather than the short axis as laid out in the scenario. This really changes the whole complexion of the game so we decided that we would replay the scenario. We will redice for supports but I will not redice to see which units I have available. Hmm...there is something just not right here! 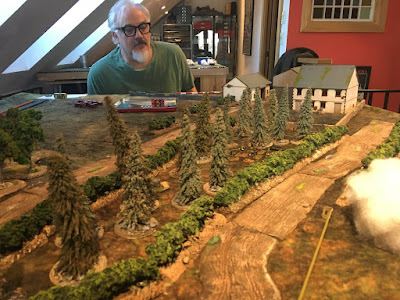 The good news is that Mike is going on Sabbitical for 6 months starting in a month so as I am off 2-3 days of the week, I am hoping we can get our next game in soon. It looks like its going to be a very challenging campaign for the British Player. A very good post John, well described action and of course I enjoyed the photos. That is a fine table set up you have there. Great looking pictures, beautiful units...and fields! A lovely set-up! I'm looking forward to seeing how this plays out. In other accounts I've read the British paras always have trouble holding the Germans in the first scenario. John, your opponent may have had an unfair advantage in Scenario 1. The Patrol Scenario does not allow a preliminary bombardment for either side and so the Werfer Barrage is not a support he could have used. 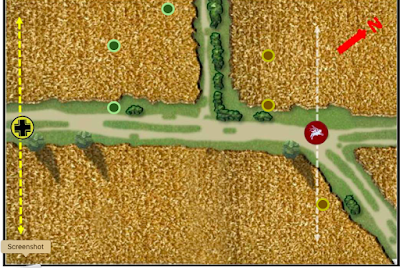 It also looks like you played the scenario on the correct axis. Despite the illustration in the rule book, you need to use the map as per the PSC, which has some variations to the core scenario in the rule book, so it looks like you played it correctly for the Von Luck campaign. The Revenant Warband is Done!